In Chapter 1, Section 1.2, I listed some of the skills that graduates need in a digital age, and argued that this requires a greater focus on developing such skills, at all levels of education, but particularly at a post-secondary level, where the focus is often on specialised content. Although skills such as critical thinking, problem solving and creative thinking have always been valued in higher education, the identification and development of such skills is often implicit and almost accidental, as if students will somehow pick up these skills from observing faculty themselves demonstrating such skills or through some form of osmosis resulting from the study of content. It is of course somewhat artificial to separate content from skills, because content is the fuel that drives the development of intellectual skills. My aim here is not to downplay the importance of content, but to ensure that skills development receives as much focus and attention from instructors, and that we approach intellectual skills development in the same rigorous and explicit way as apprentices are trained in manual skills. A skill is not binary, in the sense that you either have it or you don’t. There is a tendency to talk about skills and competencies in terms of novice, intermediate, expert, and master, but in reality skills require constant practice and application and there is, at least with regard to intellectual skills, no final destination. So it is critically important when designing a course or program to design activities that require students to develop, practice and apply thinking skills on a continuous basis, preferably in a way that starts with small steps and leads eventually to larger ones. There are many ways in which this can be done, such as written assignments, project work, and focused discussion, but these thinking activities need to be designed, then implemented on a consistent basis by the instructor. In the history scenario (Scenario E), students had to cover and understand the essential content in the first three weeks, do research in a group, develop an agreed project report, in the form of an e-portfolio, share it with other students and the instructor for comments, feedback and assessment, and present their report orally and online. Ideally, they will have the opportunity to carry over many of these skills into other courses where the skills can be further refined and developed. Thus, with skills development, a longer term horizon than a single course will be necessary, so integrated program as well as course planning is important. Discussion is a very important tool for developing thinking skills. However, not any kind of discussion. It was argued in Chapter 2 that academic knowledge requires a different kind of thinking to everyday thinking. It usually requires students to see the world differently, in terms of underlying principles, abstractions and ideas. Thus discussion needs to be carefully managed by the instructor, so that it focuses on the development of skills in thinking that are integral to the area of study. This requires the instructor to plan, structure and support discussion within the class, keeping the discussions in focus, and providing opportunities to demonstrate how experts in the field approach topics under discussion, and comparing students’ efforts. The role of discussion is covered more fully in Chapter 4, Section 4 and Chapter 11, Section 10. 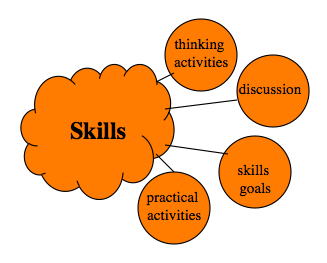 This is a very brief discussion of how and why skills development should be an integral part of any learning environment. Returning to the HIST 305 scenario, what specific skills was Ralph Goodyear trying to develop in his course? Is this section likely to change the way you think about teaching your subject, or do you already cover skills development adequately? If you feel you do cover skills development well, does your approach differ from mine? A.5 Developing skills by Anthony William (Tony) Bates is licensed under a Creative Commons Attribution-NonCommercial 4.0 International License, except where otherwise noted.